Cheese, Raisins and Mining on South Cottonwood Road (CR 228). Most of our adventuring is determined by a simple method of decision making, "Hey, there's a road; wonder where it goes and what we'll find on it?" There you go, that's how Roy and I do it; told you it was a simple method. A beautiful winter's day (December 30, 2014) found us traveling south of Blanding to Highway 95. Just a reminder for all those who read this blog, use my maps and follow the mileage directions. The mileage is determined by our vehicle's odometer and sometimes it is spot on to directions we have found on Google maps; sometimes it can be off by 1/10th to 2/10ths of a mile. So, if you're looking for something specific, have patience and look; don't give up immediately. There's your public service announcement for today. So, we just made the turn off of Route 191 onto Highway 95, stopped at the gas station on the corner and set our odometer to zero. Our objective is finding CR 228, but at the five mile mark we found CR 277; that's now on our to-do list. It was at 6.1 miles (Google Maps says 6.3) that we reached CR 228 - South Cottonwood Road. Even though it was December, we entered into a desert area that was warm enough to sit outside and have lunch. Jenna was with us, so she enjoyed a good romp through the sage brush. There is a main reason why I specifically wanted to come to this area; my dentist, Dr. Brian Goodwine of San Juan Dental in Monticello. He is the great grandson of Lemuel Hardison Redd Jr., active in the development of the San Juan Mission in Mexico. While at my 6 month checkup, Dr. Goodwine asked if I'd ever been to the Cheese and Raisins Hills; "The what? ", I asked, and "Where are they?" He told me the story of Lemuel who had cattle up on those hills; one day his ranch hands asked him if he would like to share their lunch of cheese and raisins with them. "All you boys ever eat is cheese and raisins, cheese and raisins"; and that is how the hills in the area became so named. I was able to also verify this story through the book, "Utah's Canyon Country Place Names" by Steve Allen, as told by Albert R. Lyman. On the internet, someone's vacation blog, didn't note it down though, was a second story on how the hills were named. There were several mines in the area; the miners often had cheese and raisins in their lunches. Since the mines were not started till around the early 1930s, the first version of the story is closer to the truth. The photo of Lemuel and his wife, Lucy, and their story comes from the book, "They Came to Grayson" put out by the Ridgeway Art Gallery in Blanding. ...and here are the Cheese and Raisins Hills. Better get back to the mile markings, once you get onto CR 228, there will be a split at 9/10ths of a mile; CR 240 goes to the left, CR 228 continues off to the right. CR 274 will be at mile mark 1.9 and goes off to the left. It's at mile mark 2.3 where we stumbled upon a most awesome find, the remains of the Cottonwood (aka Shumway) Millsite. 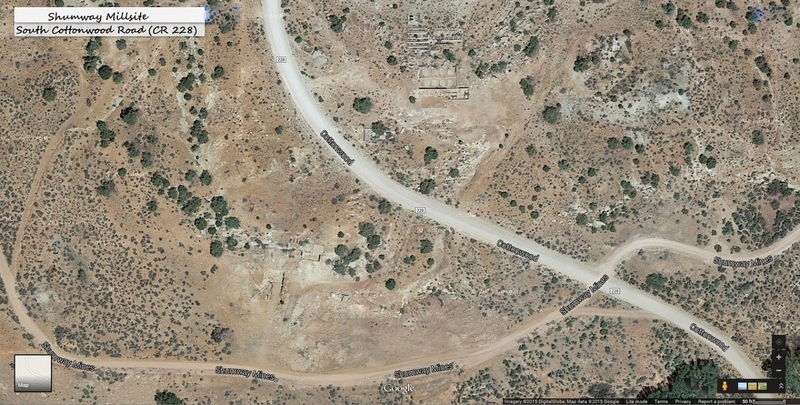 To give a better location finder, these are the GPS coordinates I got via the satellite image: 37.593675 - 109.596667 San Juan County, Utah. The history of the millsite will be a combination of information from two sources; a verbal history from Grant Lee Shumway in the book, "The Family of Peter and Mary Johnson Shumway" by Ruth Shumway Robinson and Gary Lee Shumway, and "Cottonwood Mining #2" by Blue Mountain Shadows. The first millsite was built in 1937; the high temperatures needed to "roast" the ore caused the building to burn down the same year. In 1938, the millsite was rebuilt, plus additional buildings containing a blacksmith shop, laboratory, assay office, boarding house for the workers, and a few cabins. In 1942, the mill burned down once again; it was rebuilt, with a loan from the Defense Plant Corporation, in April 1943. The mill, however, was forced to close its doors in July 1943; poor processing methods created few profits and loans could not be repaid. In 1942, the millsite in Monticello had been built and working in full force, so all the ore, and tailings, from the Cottonwood area mines and millsite, were shipped to Monticello for processing from then on. Remember, at that time, the dangers of uranium and vanadium were still unknown. We continued our journey along CR 228; CR 268 went off to the right at mile mark 4.7. At mile mark 6.5 you will be greeted with a sign announcing the entrance onto Ute Land; heed the warnings! At mile mark 7.7 was decision making time; follow FR 092 through the low level section of the Manti-La Sal Forest to Bears Ears, or towards FR 095 to Dry Wash and eventually back to Blanding. You're just going to have to wait and see what we did when I do my next blog posting that continues this adventure. Note: A huge THANK YOU!!! goes out to the ladies who run the library at the CEU Blanding campus for all the help they've given me in researching the Cottonwood Millsite. Surprise!!! Winter does come to the desert regions of the Southwestern United States; sometimes the snow stays for days on end; sometimes it disappears within hours. As I stated in my post, "Welcome to the Desert", she is an unpredictable mistress, and demands respect! On January 3rd, we took a drive between Monticello and Monument Valley along Routes 191 and 163; not only was there snow, but the clouds had descended and created mystical wintery landscapes. Traveling south on Route 191, the Abajo Mountains were a maze of sunbeams and shadows. Normally, sitting under the watchful eyes of the mountains, Monticello gets hit with more snow than the areas to the south. Not this time though, and from Blanding to Bluff, we traveled through dense cloud cover. As we drove closer to Comb Ridge (this is where Route 191 veers off and Route 163 takes over), the cloud cover eased a bit, but the snow certainly didn't. Surprisingly, when we reached the Mexican Hat area, there was not as much snow evident and the cloud cover has dissipated. The San Juan River was not fully iced over, but you could see small pieces of ice flowing along. Valley of the Gods was magical; the formations seeming to float amongst the clouds. Usually Monument Valley can be seen as soon as you cross over the San Juan River bridge, but not today; familiar landmarks had simply disappeared! Monument Valley, where had it gone? Formations slipped in and out of view; Sleeping Bear being watched over by Setting Hen; suddenly it was swallowed up by clouds. We spent several hours at a friend's home and watched the sun make short appearances, each time the clouds allowing the grand formations to show more and more of themselves. By three in the afternoon, the classic forms of the two Mittens and Merrick Butte were once again standing proud. Bear and Rabbit; there is an arch inside Bear. Since it gets dark by 5:30pm now, we left Monument Valley at 3; however, the Moki Dugway called to us and we took the trip upwards. The more shadier areas had some snow and ice, but nothing to worry over as we drove very slowly. Now I have to tell you that going down is still more fun and exciting, to us, than going upwards. The passenger gets a great view of sandstone walls, but cannot see pass the driver's head and body. The driver is so busy paying attention to the winding road, who has time to look at the landscape!?! We did pull into the parking area that allows you to photograph almost the entire Moki Dugway, Cedar Mesa and the valley below. Now while the Moki Dugway is still firmly packed down dirt and the road to Muley Point is gravel; Route 261 is now fully paved (used to be only partially paved). Route 261 goes through the Grand Gluch/Cedar Mesa area and connects with Route 95 where you can go to Natural Bridges National Monument, or to Blanding (Route 191). We were headed home, so we headed towards Route 191 and north to Monticello; we had come full circle. The Bears Ears came into view way before we reached 95; we still could not see the similarity to an actual bear's ears though. Using A LOT of imagination, I could see the eyes and snout laid out in the landscaping below the formations, but in no way did the formations themselves look like ears. Driving down 95, our beautiful pink sky mixing with the blue; the moon smiling down on the planet, wishing us all a good night and sleep tight. How much more serene can it get!?! So, this is our typical winter down here in the southeastern corner of Utah. Might not be your cup of tea, but it is what it is; the desert won't change to accommodate anyone but herself.